Designed by Judi Boisson. "A" You're Adorable "B" "You're so Beautiful !" Baby Bumper with Yellow Background. 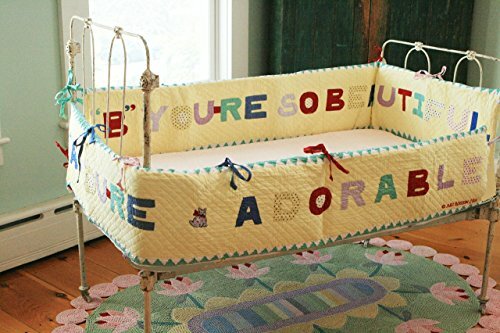 When Baby's Mommy goes to say Good-Morning to her baby , it is likely that she sees the bumper with the words "A You're Adorable..." and begins to sing the song "A" Your'e Adorable" ..."C" "Your a Cutie full of Charm". Sawtooth Edge on top and Bottom Edge of Bumper. Colorful Appliqued Letters. Hand Appliqued, Quilted, and Embroidered. Reversible. Available with Butter Background and with White Background 100% cotton. Cold Water Wash- Before Washing, please remove all inserts.